Although already on its third week, The Rise of Phoenixes makes the weekly web rankings for the first time. TV viewership remain unusually low for a drama that airs on Hunan TV. Ashes of Love continues to be the only drama to break past 1.0% in both CSM52 and CSMNationwide. 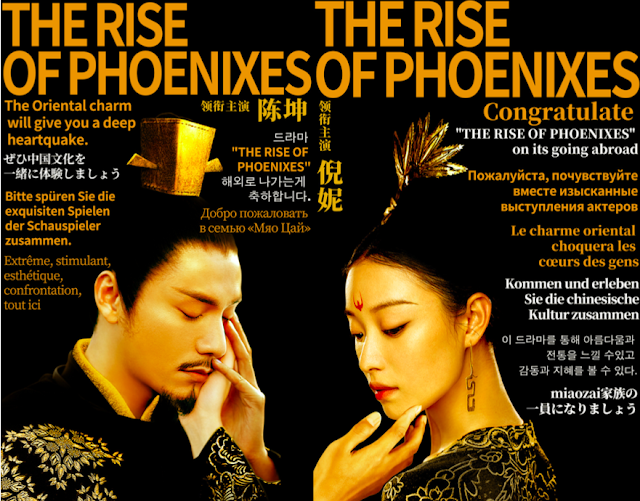 There is one more piece of good news however for The Rise of Phoenixes as it will be heading to Netflix starting on Sept. 14. That means English subs are coming you guys! 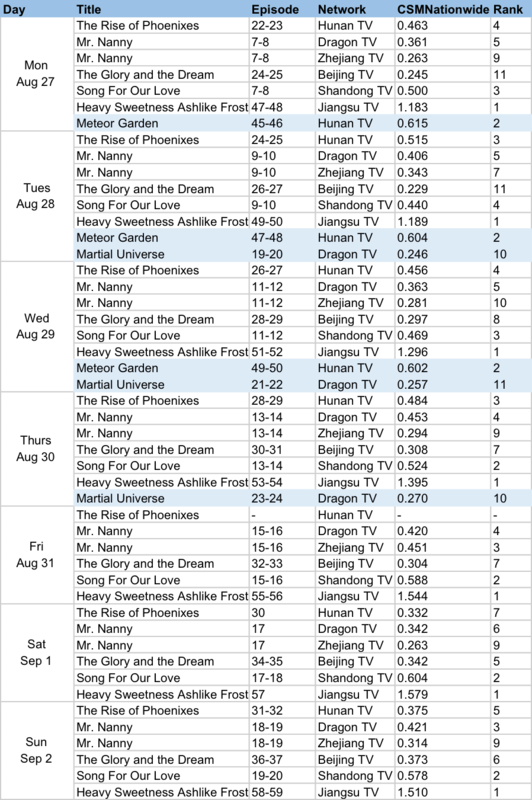 Meteor Garden has ended without much change in TV viewership. It has moved up to fifth in web rankings, though it hasn't managed to go any higher given that a number of dramas are crowding at the top. Ashes of Love has overtaken Story of Yanxi Palace. With a few days left before the finale, the show has reached over 10 billion views. The historical epic Ruyi's Royal Love in the Palace has stayed in third. Bloody Romance and Flying Swords of Dragon Gate also ended their run. The latter is a rerun that's been airing on CCTV. Both shows came in ninth and tenth on their final week. Wu Lei and Ni Ni are the new faces in the celeb rankings. 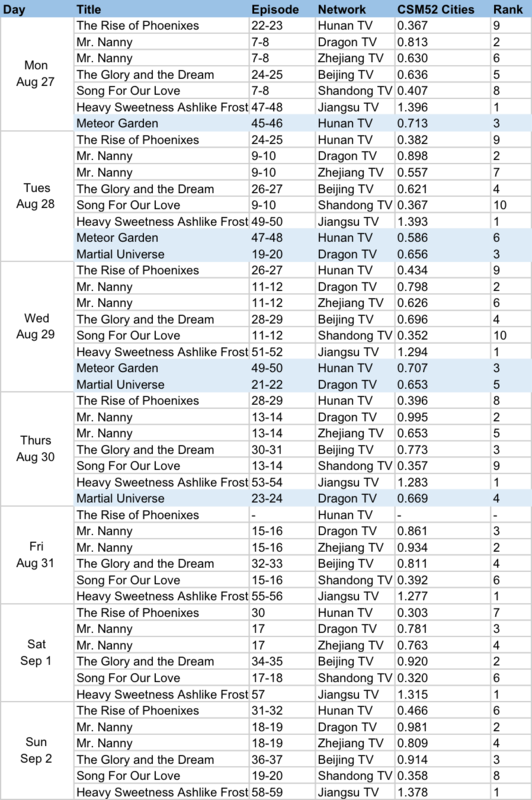 *The above are mostly primetime shows that air at 19:30 while those highlighted in blue air at 22:00. **Rankings are overall rankings across the shows airing on the same night, regardless of air time. *** Reruns are not included. **** Dramas that air on CCTV (the state television broadcaster in China) are not included. Prefer to watch Caught In The Heartbeat. Just finished Yanxi and nothing to watch lately. It's really hard to try Ruyi without comparisons and that the pacing is so much slower this time. So I tried Bloody Romance, well at least it's finally a more refreshing genre now but then its purpose was just not on point. I find it hard to continue watching something if I find it very pointless. What was everybody's goal? So far ep 1 - 10+ was nothing but about the main girl wanting to live and survive...but I never understand anybody else's goals. Like they want to assasinate people but cummon...such a nonesense and unrealistic (though overly creative) idea of unpractically training women, when will they EVER reach their goal? The crazy organization seems to be only obsess in torturing women without any other purposes, that's all I see for now. But I see the drama seems to be from a manga story so that might be why things don't really make sense, I might continue a few more episodes if it gets more interesting before I quit. I enjoy realistic dramas and Operation Moscow crime drama is based on true crime stories from 1993 siberian train robberies. Some suspects were captured many years later and some suspects have not yet been captured. In china, armed robbery can get the death penalty. China executes a few thousand people per year. America executes about 20 people per year.